A new commission launches on the Media Wall at The Photographers’ Gallery, London in Oct 2017. 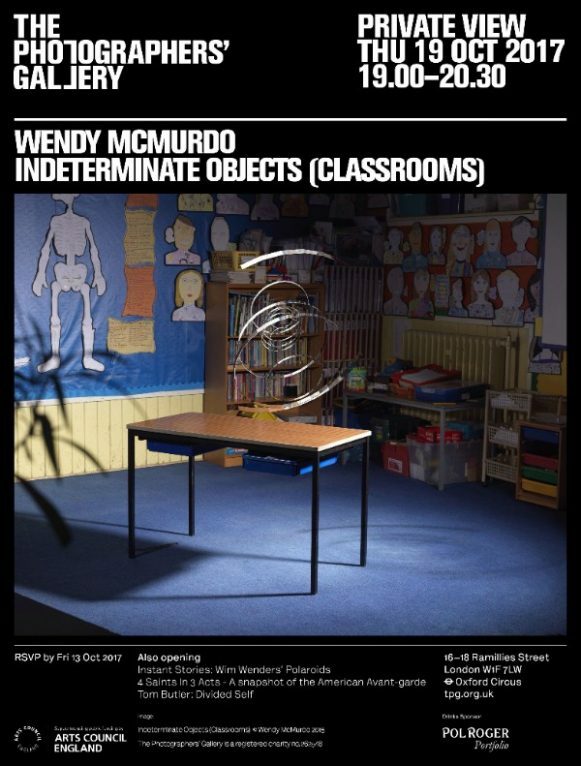 ‘Indeterminate Objects (Classrooms) is a work by award winning Scottish photographer Wendy McMurdo. The project continues her investigation into the relationship between children and computers, and is inspired by young people’s fascination with immersive digital environments such as Minecraft. For this project McMurdo photographed a series of Victorian classroom interiors at a school near her home in Edinburgh. The traditional elements – desks, bookshelves, children’s drawings – are overlaid by a series of hypnotic geometric forms. As these 3D objects hover above the desks, they enter the space of the classroom, casting shadows on the floor which mingle with those of the room. Combining still photography and animation, the project alludes to the co-existence and pervasive nature of these different spaces through which childhood is now experienced’.